Easton Walled Gardens - Lincolnshires lost gardens. 400 years of gardening have created a peaceful and settled atmosphere, enhanced by the beautiful valley surrounding it. Easton Walled Gardens nestle in a beautiful, rolling valley in South West Lincolnshire. They have been owned by the Cholmeley family for over 400 years. President Franklin D Roosevelt considered them one of the best gardens in the UK, writing home to his mother that the gardens were "A dream of Nirvana...almost too good to be true." The original gardens contained several walled enclosures around a mediaeval manor house. 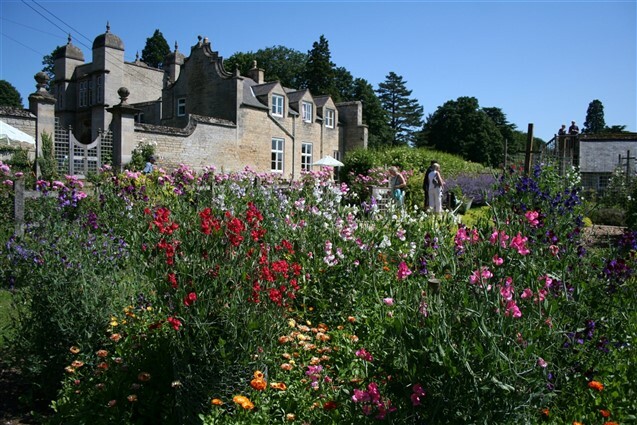 Over the centuries the design of the gardens changed and by the Victorian era the gardens were filled with bedding and borders, ornamental stonework, glasshouses, fine trees and even melon pits. All of this changed when the house was requisitioned during World War II, used as a barracks and subsequently demolished. For 50 years nature enveloped the old site until we started restoration work in 2001. The meadows cover at least 2 acres and include the Cedar meadow, the Terraces (for summer meadows) and the long grasses so important for insect and bird life in the old kitchen garden. This area is dominated by two beautiful old trees, a horse chestnut and a black walnut. The planting here is designed to make the most of the spring light before the canopy of the trees closes down the sunshine reaching the understorey. It includes hellebores, aquilegias, hyacinths, snowdrops and epimediums. As you enter under the gatehouse this is planted with texture rather than colour in mind. Tthis garden is ostensibly a traditional white garden but within its structure there are subtle allusions to the nature of the universe and our place within it. These 80m long borders have a yellow and white theme which can be seen from across the terraces or close up as you wander beside the river. The borders are given visual strength by repeated plantings of catmint, bamboo and roses interspersed with a variety of perennials such as Phlox Fujiyama and pockets of annuals. Grafted in Lincolnshire especially for us, the orchard in the old kitchen garden builds on the strong apple growing tradition in the area planted pears, plums, quinces and gages. The Vegetable Garden, The Pickery, and The Cottage Garden are more domestic in scale and it is hoped that these areas will inspire you in your own garden. Followed by free time at Boundary Mill. Boundary Mill is one of the largest quality mill stores of its kind. Offering great value for money with up to 70% off the RRP on big brands in fashion. Please wear suitable footwear for walking around the countryside.